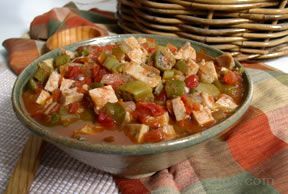 A hearty, spicy gumbo made with sweet peppers and okra for a tasty southern flair. This Chicken Gumbo recipe with its Creole seasoning is perfect for any Mardi Gras celebration and will become a favorite to serve throughout the year. In a large heavy pan, heat oil and add onion, garlic, celery, sweet pepper, and okra, cooking until tender, or about 3-4 minutes. Stir in the fresh and canned tomatoes, cubed chicken, broth, pepper, hot sauce, Creole seasonings and salt. Cook over medium heat, uncovered for 30 minutes. Remove from heat and add file powder. Gumbo can be served over cooked rice or pasta.